The mark of any truly great title is that it can be fondly remembered even decades down the line, with any return visits holding up to scrutiny time and again. Despite it being before my time by several years, I found myself being told by several others that one such release was one I wouldn’t expect. Developed by the same minds behind Mega Man, the gaming adaptation of Disney’s DuckTales (woo-oo!) is widely considered to be one of the greatest moments of the NES era, and the adventures of Scrooge McDuck and co are widely regarded nearly a quarter of a century after the fact. To this end, Capcom saw fit to replicate the success of the original with Ducktales: Remastered (woo-oo! ); a modern re-imagining of the iconic platformer, complete with a brand new art style, voice-acting provided by returning members of the cartoon and the ability to swim in the money bin whenever you want. Once again taking players from the Amazon to the Himalayas and even the Moon, by the time the credits roll you may find yourself solving a mystery, or even rewriting history. Developers WayForward have seen fit to do this themselves and, as such, there are several key changes to DuckTales (woo-oo!) that go beyond just how it looks and sounds. 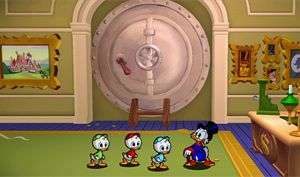 When starting your adventure, instead of immediately being able to choose between five levels, you’ll instead be given a tutorial level set inside Scrooge’s money vault after it’s stormed by the dreaded, but ever-incompetent, Beagle Boys. While veterans might potentially balk at this, it’s a worthy addition that allows newcomers to ease into the mechanics, but also does plenty to set up the plot and provide justification for McDuck and co to start gallivanting across the globe for their adventures. It transpires that the Beagle Boys were out to steal a painting of McDuck’s, and their failed attempt helps reveal the existence of several treasures throughout the globe, which the players can tackle in any order they see fit. 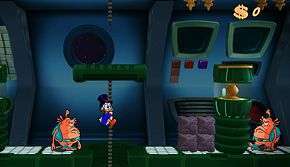 Each level is introduced, concluded, and peppered with in-game cut-scenes featuring Scrooge McDuck and the others as they set out to gather the treasures before any of his multiple nemeses can get their hands on them. While these cinematics are sparsely animated, they do much to help inject a healthy dose of personality into the proceedings, and anyone with fond memories of the cartoon will find themselves more than a little at home here, as the classic humour is alive and well. As someone who has only seen the first ten episodes or so of the series, there were admittedly a few characters who I knew very little about previously, and while the menagerie of characters may seem daunting and packed with in-jokes, it’s unlikely that you’ll feel alienated if your memory of a decades-old animated series isn’t up to scratch, but you will find yourself questioning why they don’t just hire a better pilot. The story itself is fairly low-key and is a perfectly-functional introduction to the DuckTales (woo-oo!) universe, complete with plenty of humour that wouldn’t be remiss in the original animation, but you’ll be hard-pressed to really remember plot-threads once they’ve run their course. Where your brain-power needs to be exerted is in the gameplay itself as, despite the simple mechanics on display, there’s a heavily-challenging title to work your way through. I can’t attest to the difficulty of the original, but Remastered is clear and concise in reminding players of its NES heritage thanks to the presence of a small health-bar, a limited set of lives and the fact that defeated enemies will come back to life as soon as they re-appear on-screen. As mentioned previously, there have been a few changes to the actual gameplay and, for the most part, these are all employed to help the balance tip ever so slightly in the player’s favour. Alongside the tutorial level is the addition of a map-screen that shows up whenever the action is paused – or toggled as a permanent fixture to your gamepad’s screen if you’re playing on the Wii U and don’t want to use the controller for Off-TV play. The most noticeable of these tweaks is to Scrooge’s cane, used not just for breaking blocks or hurling projectiles at your enemies and floating treasure, but also as a makeshift pogo-stick which, once activated, will bounce indefinitely until you let go of the jump button. While in the original NES version it could only be activated by pushing down on the D-pad on the descent of your jump in conjunction with the button responsible for unleashing the cane, Remastered allows you to simplify this process with the “Easy Pogo” toggle. When activated, the player need only press the cane button when falling back to earth, and for the most part this allows for some vital extra precision as you can worry less about pulling off the pogo and concentrate on making the jump without losing health or a life. Well, it should do, but I found that the command would inexplicably fail to work occasionally, causing the miserly mallard some misery and myself some minor frustration as every one in fifteen to twenty attempts would result in bad (rather than good) luck (tales, woo-oo!). Another change that newer players might find more comforting is that, thanks to the cinematics scattered throughout each level, there’s a rudimentary check-pointing system in place, so you’re never more than five minutes away from where you left off if you accidentally cause McDuck’s untimely demise. This is admittedly a smaller comfort than you’d think thanks to the fact that once you’ve lost all of your lives you’ll have to start the entire level from scratch, and any treasure you’ve accumulated or progress made up to that point will be reverted back to zero. It’s also a greater occurrence than you’d think, and even on normal mode you’ll have to start the entire level over again a good two or three times before mastering the level designs and making sure to watch behind you for any d-d-d-danger. Yet, until the final level the difficulty never feels too punishing; the first set of lives becomes a scouting mission to find hidden secrets and where the strangers are out to find you, the second batch lets you explore further and learn how to best the boss, so when you start the stage from scratch for the third time you can blitz it with the minimum of damage taken and the maximum of treasure to add to your already impressive wealth. A slight annoyance comes from the fact that Remastered doesn’t seem to remember if you’ve already attempted a level or not and thus plays the cut-scenes every time, but these can be skipped with a modicum of fuss thanks to the fact that the “Skip Cinematic” option is already highlighted when you pause them. 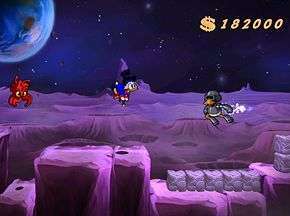 Having an eagle eye is all-important when you explore the far corners of the globe, as each stage contains millions of dollars worth of diamonds that the player can uncover by opening treasure chests or by walking and jumping to every nook and cranny, and treasures will routinely appear out of thin air once Scrooge has moved over a designated spot in the environment, with more valuable jewels being divvied out for reaching more dangerous or difficult to reach places. It’s in your best interests to try and search absolutely everywhere before taking on the boss as, once the level’s finished, you can’t go back and try it again until you’ve completed the story at least once, so completing a level with only a paltry amount of money will leave you a long while to rectify your mistakes. As the money you gather doesn’t help make the money bin any deeper, it can instead be spent on a variety of extras, from concept art to the full-length DuckTales theme song (woo-oo!). Said theme and other music will require the player to replay levels several times to pony up enough cash, as each category of unlockables is shut off until enough money has been spent on the one before it. Luckily, players don’t have to buy everything in the previous section before they can unlock the next, and while it is an interesting way to entice players to keep coming back and understandable that they wouldn’t let you unlock the best stuff right away, that it’s so locked off means you could feasibly see your interest wane before you reach the goal. Admittedly, I also found this happening with the final stage, not because of its design – well-conceived but with occasional moments that punish players for not having the ability to see into the future – but because it never seemed to end. You’d traverse the level and beat the boss, but then you’d have to race your nemeses with room for only one or two errors, then you’d have to out-climb an ever-rising pool of lava with any false step spelling your death, and the depletion of all of your lives means you’ll have to do it again from the beginning. While this sort of difficulty works well with the other levels, in this circumstance it can make things a little tiring, especially as it took me over three hours’ worth of attempts to beat what eventually became a fifteen-minute stage. Even then, it was far more tiring than it was frustrating, and worked as a fitting end to the adventure in context, especially in regard to its origins when challenging precision was the prevailing design philosophy. From start to finish on normal mode it took me around ten hours to reach the credits, although that will reduce itself significantly on subsequent play-throughs when you’ve learned the level designs and know where the bulk of the treasures are, and there’s plenty of incentive to go back if you want to unlock all of the extras available. If anything, I may find myself going back sometime soon just to soak in the art-style and the music. I spent the majority of my play-time using the Off-TV play on the Wii U’s Gamepad, but admittedly the times when I found myself truly appreciating the 2.5D aesthetic was when I was viewing the action on the big screen. 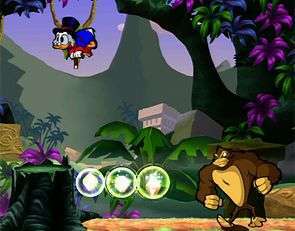 The way each character and enemy is drawn just oozes with personality, with their limited animations filled with subtle nuance, while the three-dimensional platforms and landscapes allows for some genius details, like other characters performing tasks in the background that may escape your glance if you’re concentrating too hard on your platforming. Similarly, the soundtrack is an absolute joy, and on a couple of occasions I found myself putting Scrooge in a safe place and leaving him there for a few minutes instead of pressing pause just so I could take in the sounds. There may be the occasional issue with difficulty and the pogo sometimes wouldn’t work for me, but there’s not much to reasonably fault. The art-style and music are distinctive and memorable, the difficulty is challenging, but rarely unfair or frustrating until the final stage, and the ability to swim in the money bin whenever you want is always a delight, even if it’s ultimately a hilariously-redundant feature. It’s clear from the offset that Capcom and WayForward have gone all-out to make sure that it’s a remake worthy of its legacy, and a once-great adventure is only bolstered by the voices from the cartoons and the gameplay tweaks throughout. Even if you’re as miserly with your money as Scrooge McDuck himself, you’d be a fool not to part with your hard-earned dimes for DuckTales: Remastered. Woo-oo! That elusive sweet spot of providing a strong challenge while being rarely frustrating. Mechanics are easy to learn without feeling too simplistic. Level designs work to make each feel vibrant and distinct. Catchy soundtrack (and I don't just mean the theme tune). You can swim in the money bin whenever you want. ... Though the story is bare-bones and the cinematics lightly animated. Occasional issue where the pogo command wouldn't respond. Final level might give you repetition fatigue. Replayability factor is solely defined by how much you like unlocking extras. As someone who missed out on the original DuckTales (woo-oo!) all those years ago, Remastered is an amazing title all of its own, with plenty of laughs and challenges that present themselves in a way that rarely frustrates and frequently rewards. Coupled with amazingly-drawn characters, a great 2.5D art-style and a soundtrack that's catchy and enjoyable, even if you don't count the iconic theme tune. Your final running time might not reach double figures, but you'll still leave DuckTales: Remastered (woo-oo!) with a smile on your face and a feeling that your money was well-spent. It's never been so much fun being the one percent. Tags: Capcom, Ducktales, here in duckberg, it's a duck blur, life is like a hurricane, might solve a mystery or rewrite history, race cars lasers aeroplanes, They remade the wrong game!, WayForward, Woo-oo!